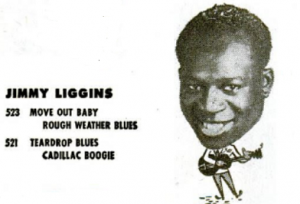 As winter turned to spring in 1948 and rock ‘n’ roll itself was becoming more firmly established as a surprising commercial threat, Jimmy Liggins, one of its innovators, was riding high. Higher than he’d ever been and – spoiler alert – higher than he’d be again for quite some time. His two groundbreaking records in this new style thus far, I Can’t Stop It from November and the scintillating Cadillac Boogie from January, had established much of the musical exuberance and the celebratory outlook that rock ‘n’ roll was adopting as its primary characteristics. On the basis of those two records he seemed to instinctively understand what attributes to emphasize for greatest effect. He, more than most, had figured out how to best use the horn section by stripping away the dainty mannerisms that were an unwelcome holdover from previous musical motifs. His records churned with tightly played grooves with the saxophones, not the trumpets as was still too often the case with other recordings, providing the appropriate muscle. Meanwhile the rhythm tracks that were the underpinning for everything were lean and sinewy on these songs. The drums were emphasized more than most of his competitors had done to date, with crashing fills and a steady backbeat anchoring the proceedings. The piano was used primarily to support the rhythm, its left hand, not the right, enforcing the main directive to always keep everything moving. Lastly, the lyrics and the vocals, while relatively basic in construction, never lost sight of their purpose as he saw them – to boisterously celebrate life in the present and give notice that tomorrow will be even better. For ALL of this he must be given ample credit and it certainly could be argued that he embodied the rock spirit better than anyone in the first few months of its existence. The drive, optimism and rampaging spirit in Jimmy Liggins’ work to date placed him at the forefront of the music as the birds flew north in the early spring of ’48. But of course it was none of THESE things that elevated him to his current position in the music world, the pinnacle of his commercial impact, and the stature he was enjoying where he was (how did I put it?) “riding high”. In one of the frustrating contradictions that makes life itself so bewildering at times, Jimmy Liggins’ early success didn’t come from the invigorating Cadillac Boogie, one of the most exciting and influential songs of rock’s youth, but rather for the flip side of that, a weird hybrid of pure blues-styled vocals married to a sedate, mournful melody entitled Tear Drop Blues, which was now sitting comfortably in the Top Ten of the Billboard race charts (but, lest anyone ask, way too far from rock ‘n’ roll to be artificially shoehorned into our history of rock here on Spontaneous Lunacy). Incomprehensibly it’d wind up being his biggest hit this decade. For all of his forward thinking experiments which to others at the time must’ve seemed reckless and risky at best and unmusical noise at worst; for all of his commitment to be at the vanguard of this movement as it took shape; maybe even for all of the good-natured teasing older brother Joe gave little brother Jimmy for his making such a racket on wax when he finally got the chance to record for himself… THIS was his reward?!?! His rather timid concession to yesterday’s music (ironically music more suited to his refined bandleader brother Joe Liggins, the far bigger star in the family) was now in the process of giving the younger Liggins his greatest success until 1953? Well, we KNOW how it’s possible… in fact, we know why it was not just possible but even predictable. The traditional musical establishment is more firmly (pardon the redundancy) established and doing something that has appeal to that larger audience is more apt to pay off commercially. At least for a little while longer. But it’s never the concessions to yesterday that define tomorrow. Music needs people like Jimmy Liggins to advance the thinking and expand everybody’s outlook, just as music had needed Joe Liggins a few years earlier to advance it from a previous stage and give it a new, more modern sound for its time. Without these leaps forward, as jarring as they may appear to those still enamored with the fading strains of the last big leap a few years earlier, music would never progress. This is true in all fields, from pop on down. After all, who needs new records by Frank Sinatra in the mid-1940’s if Al Jolson’s records from the 1920’s are still deemed vital? For that matter, who needs Jimmy Liggins if Andy Kirk & His Clouds Of Joy still cut it? 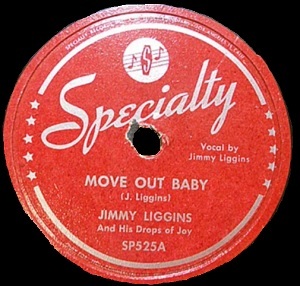 It’s either funny… or ironic… or telling… that Liggins, while enjoying his biggest success yet for a thoroughly dated track, was – with this record – in danger of having his status as the freshest, most vibrant artist on the rock ‘n’ roll block (a position established by those first two rock sides) end at the same time. Though Move Out, Baby thankfully isn’t another tepid offering in the vein of Tear Drop Blues, but it’s also not nearly as advanced as either I Can’t Stop It or Cadillac Boogie, even though it adheres to almost exactly the same framework. What that means is he was entering into the stage of being “stuck” in place. All types of music face the same inevitable arc when mapping out their course. Sounds quickly go from being ahead of their time to defining their time to being behind the times. Usually it takes a lot longer than three consecutive releases by the same artist in a span of just five months to go from progressive to regressive, but it’s not unheard of either to transpire that quickly. On I Can’t Stop It released back in November of ’47 Liggins sounded startlingly fresh, like he was the first to discover a new key to unlock the rock kingdom’s treasure vaults. Soon after in January with Cadillac Boogie it was clear he’d looted those vaults and was riding around in style, bedecked in the flashiest jewels and showing off his new stature as being one of the leaders of the movement. That was the record that defined the potential of rock music as 1948 got underway, a gleaming light that could be seen from miles away letting everybody know this trailblazing new style was something special. What he needed to do now was get back down to work, to put some distance between himself and those clamoring in the streets behind him, racing to catch up and take over his spot at the front of the parade. Instead he was coasting, soaking it all in. But that gave everyone else – the ones who hadn’t enjoyed the ride yet – the opportunity to catch up and now some were now in the process of passing him. That happens all the time in life, and nowhere more notably than in music. An artist starting out has an abundance of ambition and drive, a restless desire to prove themselves and the indefatigable energy to devote every waking minute toward achieving their artistic goals. If those traits are combined with talent, and their instincts can connect with an audience, their ascension is all but assured. The list of names through the years who fit that profile in rock is far too long to print here, but suffice it to say, we’ll meet them all in due time. But when that happens, when their goals become a reality and their dreams of success come true, that’s when they’re at their most vulnerable to be left behind because they suddenly can afford to relax. Exhale. Stop pushing forward relentlessly and enjoy that success. Yet the more they enjoy it, the less OF it they’re likely to get going forward. The combination of talent, ambition and hard work are often seen in that descending order, with talent being the rarest commodity and thus the most necessary for achieving success. In a way that’s true, but it’s also the one thing among them you, as an artist, CAN’T control. It’s a gift, something you’re born with, like the DNA for good looks, athleticism or brains. But it’s the other two areas, the ones you can control, that allow you to take advantage of the first, and those, sadly, are often the ones you take for granted and don’t always nurture. Move Out, Baby cut in the last days of December, sounds as if he’s consciously recycling the earlier gems – no doubt pressed for material with the recording ban imminent – but the result is the ambition and inspiration are not up to the levels his previous efforts. It sounds as if he’s taken his foot off the accelerator. The song’s structure is working from the same blueprint, like a style of house where the only thing that changes from one to another is the location. So we’re already at risk of feeling let down for not having anything new to focus on. Ahh, but as in real estate location is everything, or in this case the lot they build it on, the view it affords, the quality of the materials they use, will determine if this house sells. It’s the little things that knock the price on this dwelling down a few notches from its closest neighbor, I Can’t Stop It. Whereas in that song the rousing horns were joined by tribal drums on the intro, giving it an energy that was overwhelming to the senses, here the horns take it alone and sound subdued in contrast. Liggins own contributions when the vocals start are similarly underplayed and now the horns are acting as a counterpoint to his voice and it just doesn’t work, they clash in both tone and intent. It’d work far better to let the rhythm section handle the backing with the horns delivering urgent sounding interjections before taking off for the solos. But it’s not just the arrangement that falls short, the song itself is also demonstrably weaker. Though the lyrics are serviceable they’re not exactly memorable and because essentially they’re using the same melodic structure of a song he’s already connected with he’s running the risk of having you recall the earlier lyrics instead and that’s a battle Move Out Baby isn’t going to win. Though there ARE differences, they’re slight, but telling all the same, as something as simple as him going up the scale at the end of each line in I Can’t Stop It, which has the effect of keeping the song surging forward, is replaced here with a drop at the end of each couplet (much like he did on that record’s flip, Troubles Goodbye, where it also didn’t work as well), dulling the momentum ever so much. The most notable difference comes in the solos though, where on his debut there was a sense of barely contained chaos, horns blaring and drums pounding in a stop/start rhythm that was infectious and sounding borderline dangerous to those not used to such frantic displays. Here they’re far more restrained, emphasizing melody more than beat, and while it’s a fairly uptempo, even slightly energetic, melody, it’s not a wild cacophonous sound and so it doesn’t leave your heart pounding as you were hoping and probably expecting based on Liggins previous efforts. All of this doesn’t add up to a BAD record though, just underwhelming after what came before it in his catalog. It’s still capably delivering enough of what you crave to hold your interest and when compared with the competition on the market as winter draws to a close in 1948 it’s not being outpaced by TOO many other records. But those which are pulling ahead of him, namely the latest efforts by Wynonie Harris and Roy Brown, do so with ease. Then again when two of the records already on the market which far outpace this in excitement, energy and inspiration are Liggins’s own two previous releases, the problem becomes more acute. As a result Move Out Baby comes off less as of a “current” offering into the rock sweepstakes and more of a warmed over pastiche of his already established winners. What it really comes down to is that this record is the sound of contentment rather than ambition. Of yesterday rather than tomorrow. Leave a reply on "Jimmy Liggins: “Move Out Baby”"